As with Thanksgiving dinner, with meatloaf Jen was more excited about the leftovers than the actual meal itself. Thus I present this giant meatloaf sandwich. I served the slices of hot meatloaf on a lightly buttered and grilled baguette with sliced onions, more of the Sir Kensington's Gourmet Scooping Ketchup and sliced Grafton cheddar. On the side: pickles and oven fried potato wedges. I think I liked this more than the actual meatloaf. All said and done I don't think I'm a huge fan of meatloaf in its natural state. Unfortunately the batch I made was huge and there is another giant meatloaf log in the freezer at the moment. Maybe I'll have to look for creative ways to use meatloaf for the fateful day when I have to thaw it out. Maybe there's an Iron Chef meatloaf battle that I can watch to draw inspiration from. The meatloaf ice cream is going to be interesting. 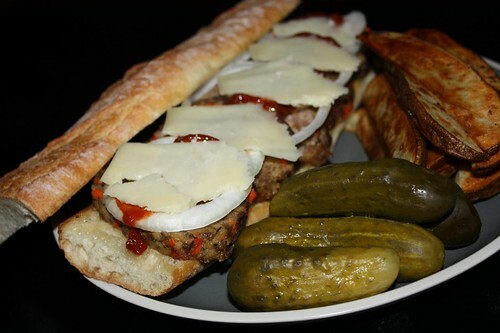 It is very difficult to beat a meatloaf sandwich.